Tyre suppliers Pirelli expected three stops to be the ideal strategy, and they were correct, but I don't think anyone predicted the soft tyres would only last five or six laps before being ditched by most of the drivers. With a couple of drivers opting for different strategies, it was fascinating to watch the race unfold and see who had chosen well and who was left floundering. At this late stage in the season, tiredness set in, and with such a busy pit lane, it was only a matter of time before mistakes started to happen. With that, plus a couple of retirements, some fantastic overtaking moves, and a tense fight for the win, Brazil had plenty to offer the watching fans. Hello there, fellow F1 fans, are you ready for the Brazilian Grand Prix? I know I am! No matter what the state of the championship, racing around Interlagos is always a spectacular thing to behold. There's been talk of rain across the course of the weekend but we haven't seen much of it yet. And there are blue skies over the track at the moment. That can change quickly, but it looks nice and clear for the start. With half an hour to go until the start of the race, the pit lane has opened and the cars are making their way out for installation laps and to make their way to the grid. Some of the drivers may have been a bit cavalier with their tyres yesterday assuming it was going to rain today. Pirelli are anticipating a three stop strategy to be the ideal way through the 71 laps. It's the medium and soft tyres on offer this weekend, with the softs expected to last for a very short time, and the mediums to be the better tyre to cover most of the distance. Nico Rosberg snatched pole position from Lewis Hamilton yesterday, and thus secured himself the pole position trophy for 2014. That's not really the trophy he's looking for though, and goes into this weekend needing the best possible result. Two drivers took penalties, but were towards the back of the field anyway. Sergio Pérez had a seven place drop for his crash with Sutil in Austin, and Kvyat had the remainder of an engine penalty to take. They line up at the rear of the field. Adrian Sutil has apparently got a problem with the turbo in his Sauber and will start from the pit lane. That's a shame for the Sauber team, as they had a reasonable qualifying. Esteban Gutiérrez starts from 11th. Felipe Massa on the grid about the possibility of a win: "I will try everything I can. The race will be difficult, it’s very hot. The car is feeling good." Toto Wolff on fielding the two championship contenders: "It’s very intense at the moment, they don’t say a lot to each other, it’s going down to the wire. They can see each other’s setup, we want to keep that structure because we learn as a team and we progress as a team, especially for next year. It’s all very transparent. It’s tense but we like it." The drivers have made their way to the front of the grid for the national anthem. Tweet from @SkySportsF1: Maldonado on his chances of #BrazilGP points: "The car's looking good so we'll do our best." Starts P16 today. The weekend has been a little windy so far, with several drivers complaining about the conditions out there. Kevin Magnussen is informed over the radio "There's a headwind from the right into turn four." It is, in fact, so bright and sunny that the drivers are having umbrellas held over the cockpit to keep them a little cooler. The top 11 drivers are all on soft compounds, with Vergne, Maldonado and Pérez also opting for the soft compounds. Hülkenberg, Sutil, Grosjean and Kvyat are the only drivers starting on the medium tyres. The grid clears of personnel as the engines start to roar. Rosberg leads them off for the formation lap. Hamilton is asked for feedback on a practice start, he says it was "slightly under-engaged." Round the final corner and the grid forms up to await the starting lights. Rosberg gets a good start and leads Hamilton into the first corner, Massa takes a wider line but retains his third place. A really clean first couple of corners for the entire pack, as Sutil files in behind after starting from the pit lane. Sebastian Vettel loses a couple of places after getting out onto the kerbs and losing time. Räikkönen dropped back at the start, behind Gutiérrez and Hülkenberg but he's already charged back past one of them. Team radio to Felipe Massa: "Okay Felipe, track is slippery at turn two, there may be oil down at turn two." The top five remain in their starting positions, with Magnussen and Alonso gaining from Vettel's misfortune. Ricciardo sits ninth with Gutiérrez moving into the points at the moment. Bottas is already complaining about graining on the rear tyres, as drivers look to extend the life of the softer compounds as long as possible. Rosberg managed to get more than a second ahead of Hamilton just as DRS was enabled, Hamilton in turn did the same for Massa. Hamilton sets the fastest lap as he tries to close the gap again. Rosberg responds. Pastor Maldonado comes into the pit lane, from 16th place, he rejoins in 17th, swapping the soft tyres for the mediums. Felipe Massa comes into the pits, with Sergio Pérez also coming in for a tyre change as well. That's very early for the Williams driver from third place. Bottas and Button are next in line for the pit lane, with Vettel also diving in for fresh rubber. These are all incredibly early stops, but now they will all be reacting to each other. Incident involving Felipe Massa under investigation - speeding in the pit lane. More pit stops - Rosberg, Magnussen, Alonso and Ricciardo. 5 second stop/go penalty for Felipe Massa - speeding in the pit lane. Lewis Hamilton takes his turn in the pit lane, as Valtteri Bottas puts in the fastest lap of the race so far. Hamilton rejoins right behind teammate Rosberg, that was closer than Nico would have liked. Hülkenberg is leading the race, with Kvyat behind him. Rosberg and Hamilton are third and fourth, having taken their first stops whereas the first two have not. 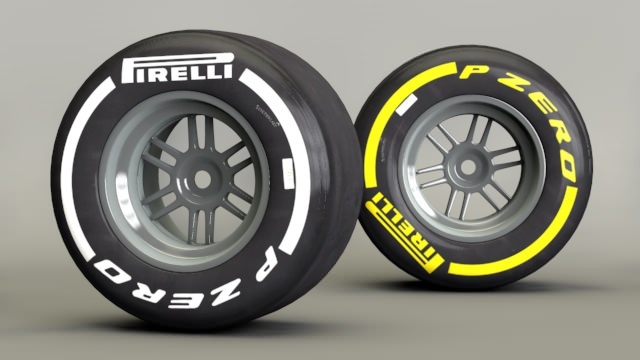 Tweet from @pirellisport: The entire field is now on the medium tyre. Rosberg has already fought his way past Kvyat, to move into second place. Both Kvyat and Hülkenberg are on the medium tyres so may not be coming in any time soon. Kvyat loses out to Hamilton down the home straight, leaving just the Force India out in front getting in the way of the Mercedes pair. The only other drivers not to have pitted yet are Romain Grosjean up in 6th, and Adrian Sutil up in 8th. No, make that 9th as Jenson Button gets past the Sauber driver. Rosberg dispatches Hülkenberg with ease, to retake the lead and put a bit of breathing space between him and his teammate. Bottas locks up as he hustles for pace behind Grosjean. He'll want to get past that Lotus as soon as possible. Radio between Hamilton and his engineer suggests he's not so happy with the car as his lap times might suggest. He's closing up behind Hülkenberg though, soon to get past. There he goes, Hamilton passes Hülkenberg and resumes second place. The Red Bull drivers have lost out in the first round of pit stops, sitting down in 12th and 13th. Vettel is told that his teammate is dropping back to reduce the pressure on both their tyres. Nico Hülkenberg pits at last, as Daniil Kvyat remains out on track but loses a position to Felipe Massa. The crowd like that. Kvyat is in fourth now. Kvyat and Sutil both pit now, leaving Grosjean as the last remaining driver yet to pit. Toto Wolff looks stressed in the Mercedes garage as both his drivers are complaining about various woes on their cars. Oversteer here, vibrations there. Replays of Adrian Sutil's stop show a delay as the rear right got stuck. He was last after starting from the pit lane but is right back there again now. Team radio to Daniel Ricciardo: "Some people have blistered the right front on primes - deg is a bit higher than we expected." Hamilton's tyre wear issues don't stop him setting the fastest lap of the race so far. But he backs off again on the next tour. Magnussen chases down Grosjean and sweeps past for sixth place after the Lotus driver locks up at the bottom of the hill. Magnussen took the inside line through the final corners so hopefully Grosjean hadn't wanted to pit because the entry was blocked by a McLaren-shaped object. Grosjean is holding up a train of cars now, with Alonso moving to the right of the Lotus to get past. Another mistake by Romain and Vettel also overtakes. The Lotus driver finally manages to get into the pit lane, following Sebastian Vettel who takes his second stop of the afternoon. Felipe Massa also comes in for a second stop. Massa took a slow stop there, taking his five second penalty from the previous pit visit. He rejoins in 13th place. Nico Rosberg comes in from the lead of the race which puts Hamilton out front. Magnussen and Bottas also take their stops. A really slow stop for Bottas, who is held up in the pit box as a mechanic delves into the cockpit - it looks like they're doing up his seatbelts or something. More pitstops: Ricciardo, Gutiérrez, Vergne and Maldonado. Hamilton put in the fastest lap there, trying to put the hammer down and take the advantage over his teammate. But he goes off track at turn four, before diving into the pit lane. Replays of Hamilton's off are pretty impressive, he hit the brakes and locks up before drifting sideways over the run off and then continuing onwards. It looked like fun, but he probably wasn't enjoying it much. The damage done means Hamilton does rejoin behind his teammate, Rosberg moves back into the lead. Incident involving Sergio Pérez under investigation - speeding in the pit lane. 5 second stop/go penalty. Hamilton worries about his mistake, saying it was stupid, but his engineer tells him "don't worry, all is not lost." Vettel has moved up into the points at the moment, now 8th behind Kvyat. The same drivers are running longer into the race before their second stops - Hülkenberg is up in 4th, Kvyat 7th, and Grosjean and Sutil further back. However, we have Kimi Räikkönen up in third after just one stop, and he's running smoothly on those medium tyres at the moment. All drivers are on the medium tyres now, which makes sense because they're the favoured of the two (best of a bad bunch), but it's worth nothing that Hülkenberg, Kvyat, Grosjean and Sutil haven't taken the softs on board yet so still have that pain to come. The Ferrari mechanics come out into the pit lane and it's Kimi Räikkönen that comes in for his second stop of the afternoon. That was a terrible stop for Räikkönen, the front jack failed which dropped the car before the replacement tyre was on the car. They had to lift it up again to finish the stop. That's disappointingly dropped him down to 13th after what was a great stint. Vettel passes Kvyat in swift fashion, as the Toro Rosso driver tries to defend his position on the different strategy to those around him. Tweet from @clubforce: Nico comes in for the second time - a set of mediums comes off, a set of mediums comes on and he's back on it! Kvyat takes his pit stop which drops him out of the points and back towards the rear of the field. He's actually last now, Kvyat rejoining in 18th place. The entire pack are within a minute though. Ricciardo slows down, complaining of front brake failure, and he cruises back round to the pit lane, race over. The mechanics actually put the car up on jacks and have a good look, they desperately want to send him out again, but the driver himself says: "I'm pretty sure it's done." The engine goes off and it is a retirement for Daniel Ricciardo. Replays show the Australian heading down to turn one and the front left suspension twisted and failed right before his (and our) eyes. Adrian Sutil is the first driver to go a lap down, and the Sauber driver has taken on the soft tyres for this stint. 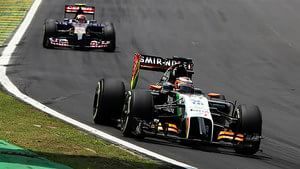 Valtteri Bottas is passed by Nico Hülkenberg, the Force India driver drifting out wide and pushing the Williams off track. That brings Kimi Räikkönen into play, and Bottas loses another position before taking to the pit lane for some TLC. It's another terrible stop for Bottas, nothing dramatically wrong like last time, but almost six seconds at a standstill for the Finn. He's down in 16th place now. Grosjean pits at last, dropping down to 15th. Alonso just battled his way past Magnussen, who put up some strong defensive moves but had to concede to the more experienced Ferrari driver. Massa is in a very lonely third place at the moment, with almost 20 seconds to the Mercedes drivers ahead, and a full eight seconds to Button behind. Magnussen and Pérez come in for their third stops of the day. Sebastian Vettel dives into the pit lane for his third stop, and Esteban Gutiérrez also visits his Sauber team in the pit lane. Nico Rosberg heads in for his third stop, relinquishing the lead back to Hamilton again. Lewis will not get the instruction to push, push, push to attempt to make up some time. Massa and Button also pit, with Felipe doing a great job to lengthen his stint to match with Rosberg. Hamilton pits the next lap round. Rosberg retakes the lead with Hamilton exiting the pit lane directly behind him. There's barely anything between them, though, less than a second. Replays show Felipe Massa ran through the McLaren pit box, mistaking it for the Williams. Claire Williams looks on with a wry smile on her face. The gap has extended by a couple of tenths of a second as Rosberg attempts to extend the gap. Felipe Massa overtakes Nico Hülkenberg to find himself back in third place, looking for a podium in front of the home crowds. Hamilton closes the gap to the race leader again, but is warned to watch his tyres. Tweet from @WilliamsRacing: Massa eventually finds us and switches to another set of primes! too many mechanics in white! Jenson Button is attempting a move on Kimi Räikkönen now, there's less than half a second between those two as they fight for 5th place. The race leaders are making their way through lapped traffic now, whilst continuing their fight. Lap after lap, Hamilton remains in the rear mirror of Rosberg, never quite able to catch him but plenty close enough to pile on the pressure. Kvyat and Grosjean come in for their third stops, taking on the soft tyres. Nico Hülkenberg takes another lap but then comes in for his own soft tyre tweak. Button moves to the side of Räikkönen but outbrakes himself into the first corner. Kimi retakes the position but then loses out to an absolutely determined Button. In fact, Räikkönen lost two places in one go there, as Sebastian Vettel closed up and moved past the distracted Ferrari driver as well. 4th for Button, 5th for Vettel, Räikkönen down to 6th. Hülkenberg only has to do eight laps on the softer tyre, and he's sitting in ninth place. Alonso has closed the gap to his teammate Räikkönen, just a few tenths between the two who are on different strategies. Yellow flags as Romain Grosjean stops at the side of the track. "Stop the car," he's instructed. As the marshals roll the car out of the way, there's some hefty smoke coming from the Lotus. As the battle at the front remains tight but stable, Alonso is still fighting to get past Räikkönen. It looks like he's getting little help from the pit wall today! All eyes are on the Ferrari pair now, with just a couple of tenths between them. Räikkönen is determined not to let his teammate past, despite Alonso bringing out his best moves. Hülkenberg has overtaken Magnussen, those softer tyres helping him move up to eighth. Much closer for Alonso on this lap, giving him the slip-stream and the DRS to take the position into the first corner. 6th for Fernando. Attention returns to Rosberg and Hamilton, then, with just two laps remaining. The final lap begins, and Rosberg has the edge. Nico Rosberg wins the Brazilian Grand Prix! Hamilton backed off at the end to finish 1.4 seconds behind his teammate, with Felipe Massa picking up third place and a podium finish! With the points haul from today, the main thing to worry about is if Rosberg wins, Hamilton has to finish second to win the championship. Massa stands on his Williams to cheer with the crowds, a great podium finish for him, particularly considering the dodgy pit stop and the five second penalty. I mean, for goodness sake, could it be closer? Tweet from @MercedesAMGF1: What a superbly controlled drive that was from @nico_rosberg - he soaked up some mega pressure there! He's only getting stronger! The champagne sprays out as the drivers collect their trophies and then pick up those bottles of Mumms. Lots of happy faces up there today. Felipe Massa waves to the crowd as the podium interviews take place. They are cheering, it sounds like a football crowd, with just a wave of noise. Brazil, as always, delivered an amazing event. Qualifying delivered, the race delivered. Compelling laps, no rain required. If only this was the last event of the season. As it is, we have Abu Dhabi in two weeks. The double points one, you might have heard of it. I'll be back with lap by lap coverage as we finally find out who will be 2014 World Champion.